Functionality blocks inside the 76477 sound chip, indicated on the die. Die photo courtesy of Sean Riddle. Looking under a microscope, you can see the circuitry that makes up the chip. The yellowish lines above are the metal traces that connect the circuits of the die. The reddish and greenish regions are the silicon of the chip, forming transistors and resistors. 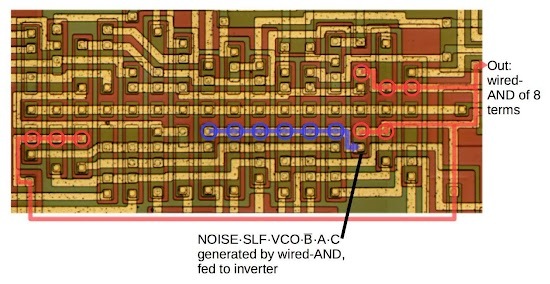 The black blobs around the edges show where tiny bond wires connected the die to the integrated circuit pins. 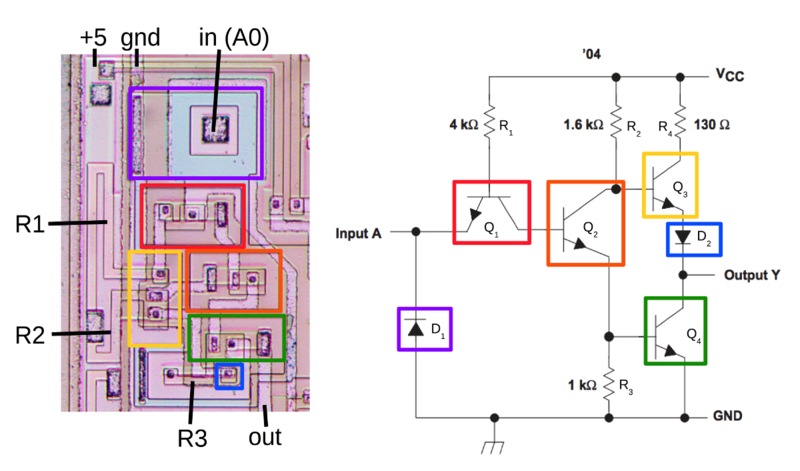 I've outlined the analog circuits outlined in purple, while digital circuits are in cyan. The 76477 is primarily analog—most control signals are analog, the chip doesn't have digital control registers, and most sounds are generated from analog circuits—but about a third of the chip's area is digital logic. The block diagram below shows the 76477 chip's functional elements and can be compared to the die photo above. 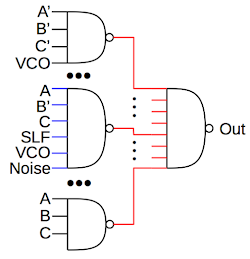 The voltage-controlled oscillator (VCO) produced a tone whose frequency depends on the control voltage. The "super low frequency" SLF oscillator generated a triangle wave. Feeding this into the VCO generated a varying pitch, useful for bird chirps, sirens, or the warbling sound of the UFO in Space Invaders. The "one-shot" produced a pulse of a fixed length to control the length of the sound. The envelope generator made the sound more realistic by ramping its volume up at the start (attack) and down at the end (decay). The digital white noise generator was used for drums, gunshots, explosions and other similar sound effects. Finally the digital mixer combined these signals and fed them to the output amplifier. 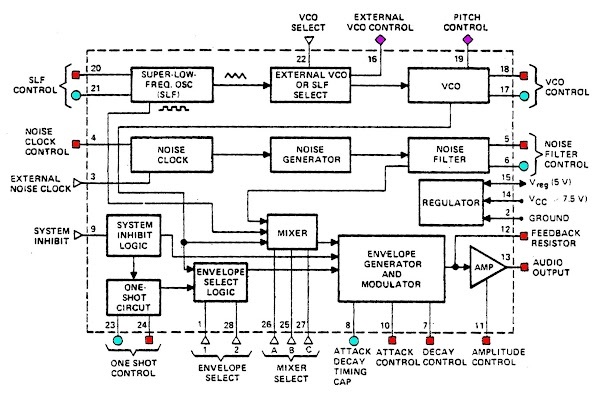 Block diagram of the 76477 sound chip, from the datasheet. Digital inputs: triangles, resistor inputs: red, capacitor inputs: cyan, voltage inputs: violet. The remainder of this article will dive into how the digital circuitry of the 76477 chip was implemented. First I'll explain Integrated Injection Logic (I2L), a short-lived logic family that was supposed to revolutionize computer chips. Next, the noise generator, control logic and the digital mixer are reverse engineered and explained. Die photo of a TTL inverter. The inverter uses four transistors, four resistors and two diodes. 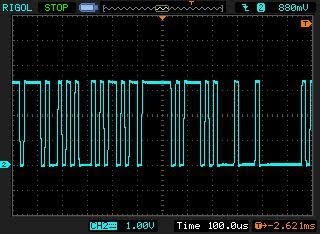 I2L solved the problems of TTL and MOS with a clever new design. Each I2L gate was built from a single multi-collector bipolar transistor instead of the multiple transistors of TTL. Even better, the transistors could be arranged in a high-density grid. Finally, the bulky resistors of TTL were replaced by an "injector", a tiny transistor that injected the necessary current. For a final bonus, I2L was compatible with existing silicon fabrication techniques and could be built on the same chip with bipolar analog circuitry. (This was important for the 76477 sound chip, which combined analog and digital circuits on one chip.) In the late 1970s and early 1980s, I2L looked like the dream technology that would take over the integrated circuit industry. A variety of I2L chips were built, including digital watch chips and some microprocessors, as well as the 76477 sound chip. Six I2L gates in the 76477 chip. Each gate is implemented with a single, compact transistor. 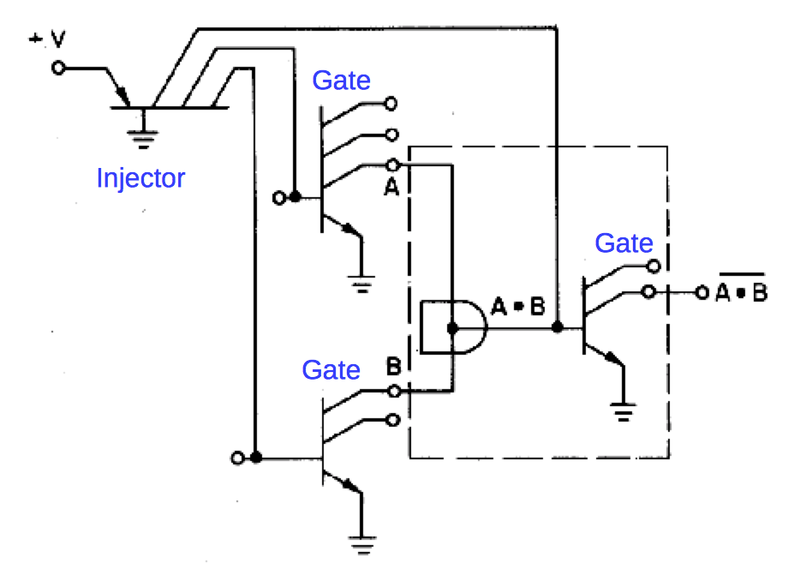 Implementation of a I2L gate. Note that it has a single input and multiple outputs. Icc is the injected current. From "Integrated Injection Logic: A Bipolar LSI Technique". Since the circuit above has a single input, it may seem to be just an inverter. But by wiring several signals together at the input, you get an AND gate "for free": if any signal is low, it will pull the wire low, and otherwise the signal is high. This is called "wired-AND". The wired-AND input to the I2L inverter results in a NAND gate. One problem arises with wired-AND: if you connect an output to more than one wired-AND, everything gets shorted together. The solution is to have multiple outputs from the inverter. Thus, each I2L NAND gate has a single input and multiple identical outputs. The outputs from various gates (A and B below) are connected together and fed to the input of a I2L gate, creating a NAND gate. Diagram of a NAND gate implemented in Integrated Injection Logic (I2L). From "Integrated Injection Logic: A Bipolar LSI Technique". Compared to TTL, I2L is also constructed "backwards". 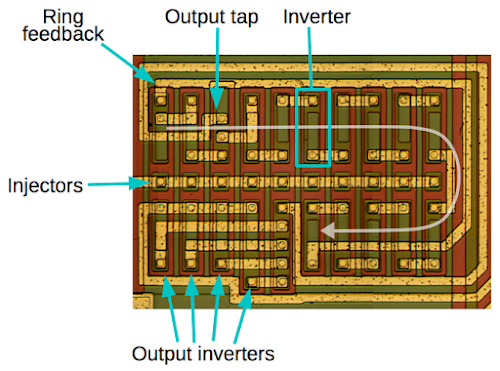 The transistors in I2L have multiple collectors, while the transistors in TTL have multiple emitters.3 It may seem strange to think of transistors with multiple collectors, but the diagram below shows how they are constructed. Each collector has an N region (brown) with a P region (green) below for the base, and another N region at the bottom, forming an NPN transistor. The multiple collector is built by creating multiple N regions. Note that the transistor's emitter is the grounded substrate. 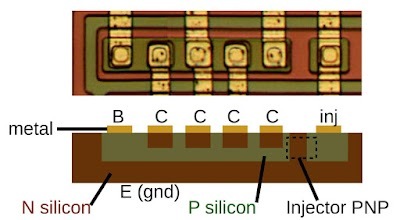 Also note that the injector PNP transistor is just a P region, reusing the emitter and base's N and P regions; this make the injector more compact than a "full" transistor. Die photo and cross section diagram of an I2L gate in the 76477 sound effects chip. The transistor base, collectors, and emitters are labeled along with the current injection. The 76477 generates sounds such as a gunshot, explosion, steam train, or drum by producing a burst of white noise, a hissing staticky sound. 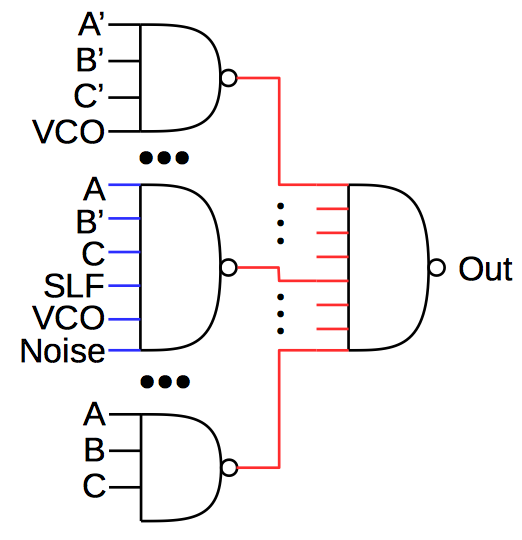 Although white noise is relatively difficult to generate with an analog circuit, it can be simulated by a digital shift register circuit.5 Linear feedback shift registers are a well-known technique, generating each new bit by combining some of the existing bits with an exclusive-or operation. With a careful design, a LFSR with an n-bit shift register can output 2^n-1 pseudorandom bits before repeating. The 76477, however, uses a nonlinear feedback shift register, a less-known technique that uses a different function to generate new bits. The output from the noise shift register is a pseudorandom sequence of 0's and 1's, output at the shift register's clock frequency. The oscilloscope trace below shows the output sequence. Random noise output form 76477 sound chip. Die photo of the shift register white noise generator in the 76477 sound effects chip. The noise circuitry is driven by a clock signal, either external or internal. The internal clock is produced by a ring oscillator consisting of 15 inverters wired in a loop. Because the number of inverters is odd, the input signal will be inverted after it goes through the loop and reaches the input. Thus, the circuit will continuously oscillate. The noise shift register is driven by a clock generated from fifteen inverters forming a ring oscillator. The die photo above shows the structure of the ring oscillator. Each inverter is connected to the next, as indicated by the white arrow. The last inverter is connected to the first through the "ring feedback" wire. The output from the ring oscillator is a bit unusual, due to the single-input multi-output structure of I2L. The output is tapped from the third inverter, which has a second output. It is connected to a 4-output inverter, which drives the four output inverters in parallel. 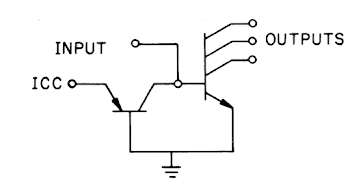 This produces an output with four times the regular current, sufficient to drive the shift register. The sound of the noise can be tuned for different effects such as a high-pitched gunshot or a lower-pitched steam engine. This filtering is done by the noise filter, an adjustable low-pass filter that processes the pseudo-random white noise produced by the shift register. While this circuit is analog, I'll explain it here since it's part of the noise circuitry. The filter is basically an integrator, controlled by an external resistor and capacitor. 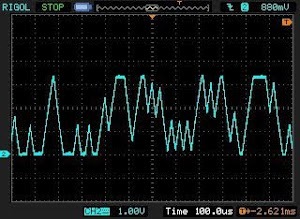 In other words, the filter converts the sharp pulses from the shift register into ramps up or down, for inputs of 1 or 0 respectively, yielding the waveform below. (A slower ramp up and down yields an output signal that changes more slowly and is biased towards low frequencies, filtering out more high frequencies.) This signal is then converted back into a digital signal, which is used as the noise signal by the rest of the chip. Random noise output form 76477 sound chip after filtering and before conversion back to digital pulses. 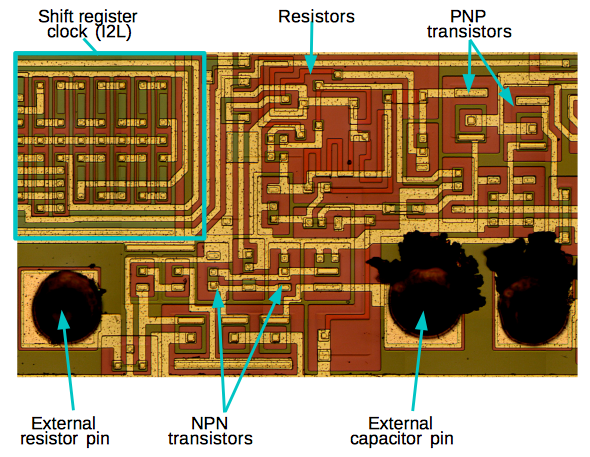 On the die, the noise filter is made of NPN and PNP transistors, along with some resistors (long red squiggles). You can see that analog circuits are not as dense as the I2L transistors. The black blobs are where bond wires connect the die to the IC pins. The noise filter circuitry is next to the shift register on the die. It is an analog circuit, built from NPN and PNP transistors. While the noise filter is controlled by an external resistor and capacitor, it is built very differently from a typical R-C filter. 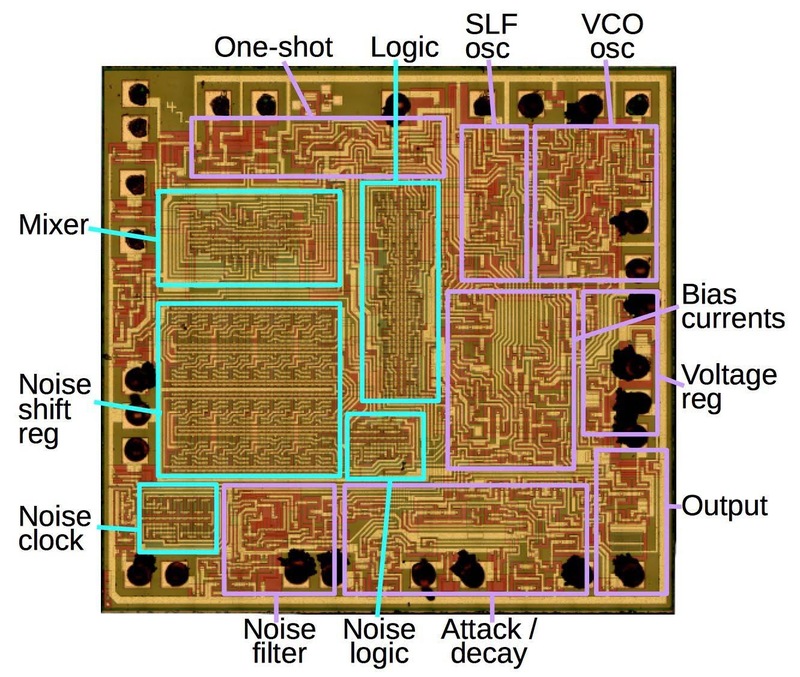 The schematic (below) shows that the noise filter is built largely from current mirrors. (A current mirror is a controllable current sources built from a few transistors, shown as an arrow in a circle on the schematic.) 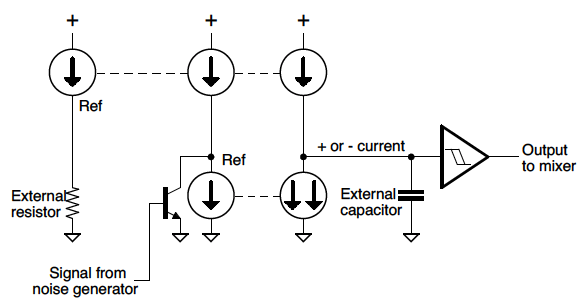 The external resistor sets the current through the current mirror reference. Under the control of the shift register output, the double current mirror (two arrows) will either sink twice the resistor current or nothing. Summing the two currents yields either a charging current or a discharging current for the capacitor, equal to the resistor current. The result is the external capacitor will be charged or discharged with a steady current, with the rate controlled by the external resistor. Finally, the capacitor voltage is converted to a clean digital output by a Schmitt trigger, and fed to the mixer. The chip uses this current mirror "trick" in multiple places and I've written about it here if the description here is too brief. 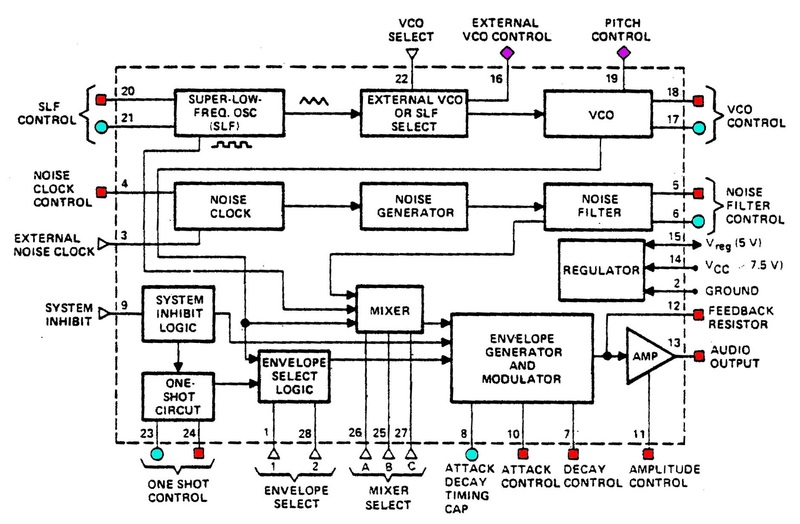 Schematic of the noise filter. 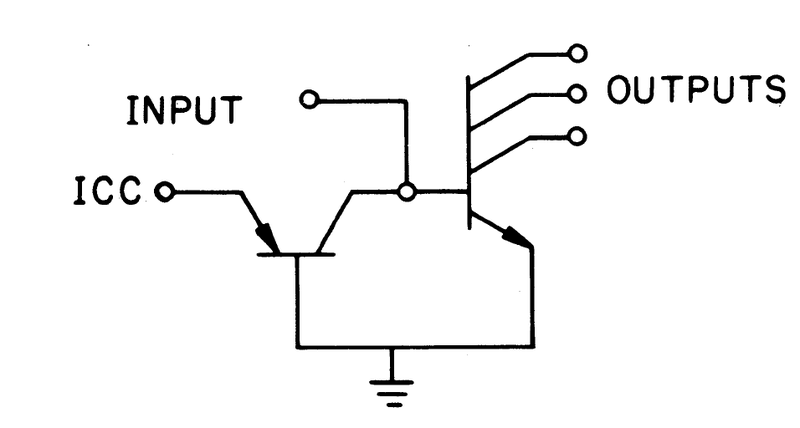 This low-pass filter integrates the input signal, using multiple current mirrors (arrow symbol). The frequency response is controlled by the external resistor and capacitor. 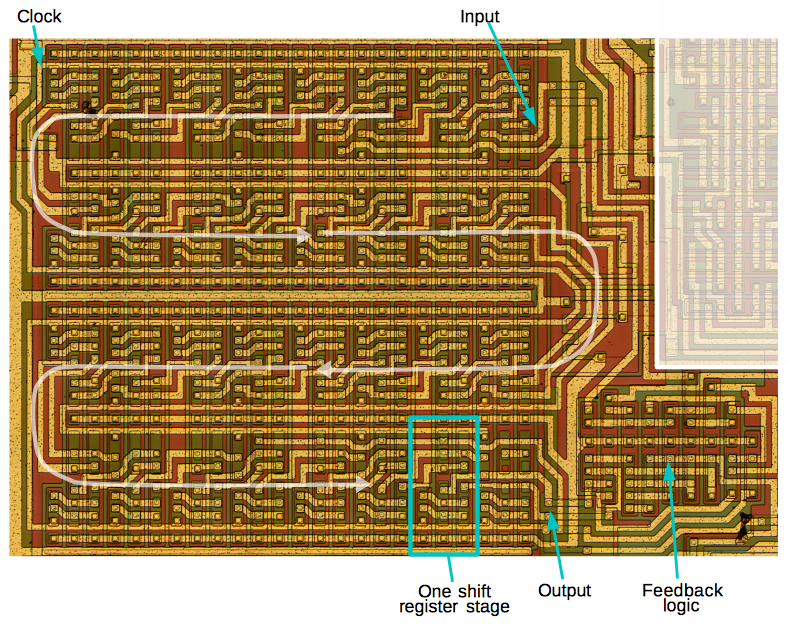 There's a block of I2L circuitry that implements miscellaneous digital logic to control the chip. It implements the envelope select logic that generates the attack and decay signals that shape the output sound.11 This logic block also processes the inhibit and reset inputs, used to produce bursts of sound. I won't go into the details of this logic; it's basically NAND gates, inverter buffers, and a T flip flop built from NAND gates. The die photo below shows the efficient, dense packing of I2L logic; each column contains two gates. 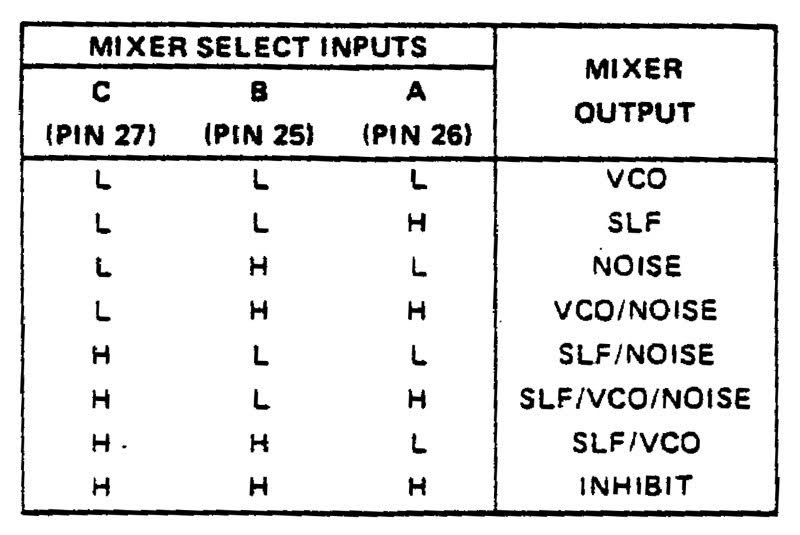 Miscellaneous logic circuits in the 76477 sound effects chip. The 76477 includes a mixer that allows any combination of the three sound sources (Voltage-Controlled Oscillator, Super-Low Frequency oscillator, and noise) to be combined to form the output. The mixer isn't an analog mixer, but just ANDs together the digital inputs. Unfortunately this makes the mixer less useful since inputs aren't combined as audio sounds, but essentially gate each other. 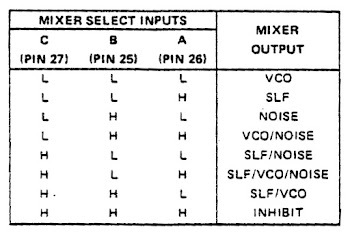 The three mixer input pins select which sound sources are combined to form the output. The mixer is implemented by an 8-input multiplexer, consisting of eight NAND gates feeding an output NAND gate (below).13 Each gate is enabled by one of the eight mixer select combinations (above), and passes the corresponding sound signals. Finally the 8-input NAND gate merges the eight branches to produce the output.12 For instance if A, B and C are low (selecting VCO), the top NAND gate is active, passing the VCO signal to the output. If A is high, B is low and C is high, the SLF, VCO and Noise signals are ANDed and passed to the output. If A, B and C are all high (Inhibit), the bottom gate pulls the output high. The logic is essentially a direct implementation of the table above. Schematic of the mixer, showing three of the eight multiplexer gates. The die photo below shows the mixer. The black line indicates the middle NAND gate, which on the die has a single input and a single output. The key point is that with I2L, a 6-input NAND gate is implemented by wiring together the 6 desired signals to a single gate input. This wire is indicated in blue with the 6 desired input signals marked with blue circles. Likewise, the eight NAND gate outputs (red circles) are wired together (red line) for the output. Interpreting an I2L circuit is confusing because of the conceptual reversal of inputs and outputs. Die photo showing the digital mixer in the 76477 sound effects chip. In the late 1970s, I2L was heralded as the technology of the future, combining the speed of TTL integrated circuits with the density of MOS.9 I2L reached its peak with the production of 16-bit microprocessors by Fairchild and Texas Instruments in the 1970s and 1980s.14 Fairchild's I2L Microflame processors lived up to their name, running so hot that some chips were packaged on beryllium oxide, a toxic ceramic that conducts heat better than most metals. Unfortunately for I2L, CMOS turned out to be the winning technology. CMOS's extremely low power consumption and scalability allowed CMOS chips to hold exponentially more circuitry (as described by Moore's Law) making modern microprocessors possible. Thus, the processor you're using now is built from CMOS and I2L is a historical footnote. The 76477 sound chip is an unusual combination of analog and digital circuitry, using I2L for the digital logic. Since the sound chip was primarily controlled by resistors, capacitors and voltages, it was difficult to control with a microprocessor. As a result, the 76477 sound chip was soon overshadowed by digital sound chips, such as the AY-3-8910 and the 76489 that could easily be interfaced to a microprocessor.15 Nevertheless, the 76477 chip was popular with hobbyists as it was easy to experiment with and readily available at Radio Shack. Although long obsolete, the 76477 still lives on in the occasional retro project and (inexplicably) an iPhone app. The 76477 sound chip was popular with hobbyists and sold at Radio Shack. Photo courtesy of Bill Lewis. I announce my latest blog posts on Twitter, so follow me at kenshirriff. I also have an RSS feed. Thanks to Sean Riddle for the die photos.